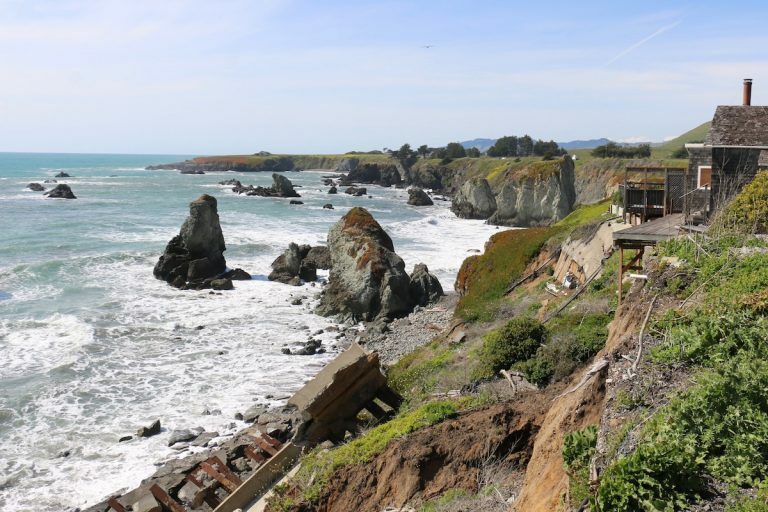 That California’s coastline is eroding rapidly is hardly news. A recent study found that 67 percent of Southern California’s beaches are at risk of disappearing completely by 2100. Think about that! Nearly three quarters of Southern California’s iconic beaches – important economic drivers, crucial ecological habitat, cherished public recreational resources – may be gone, taking many beloved waves with them. The rest of the state’s beaches do not bode well with sea level rise either. Sea level rise, dams that trap sediment upstream, coastal armoring and other manmade structures – all contribute to the problem. This may sound depressing and hopeless but fear not! That is one statistic that we can influence greatly depending on how we respond. Last week, Surfrider’s California policy staff attended the California Shore and Beach Preservation Association’s Coastal Conditions conference in Bodega Bay. The conference brought together many of the state’s top engineers, firms, academics, agencies and staff to discuss this important topic. 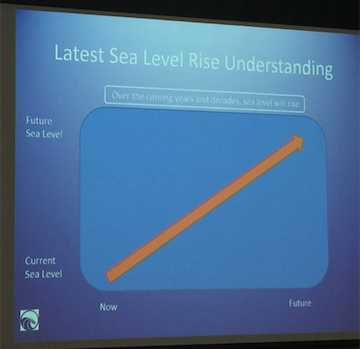 As Lesley Ewing, Senior Coastal Engineer at the California Coastal Commission, astutely pointed out, our seas are rising over the coming years and decades (see photo above), Unfortunately, this obvious and now well-understood phenomena is still not well integrated into our planning and permitting decisions. For example, we know that armoring the coast in response to sea level rise and associated increased erosion only serves to further increase erosion. 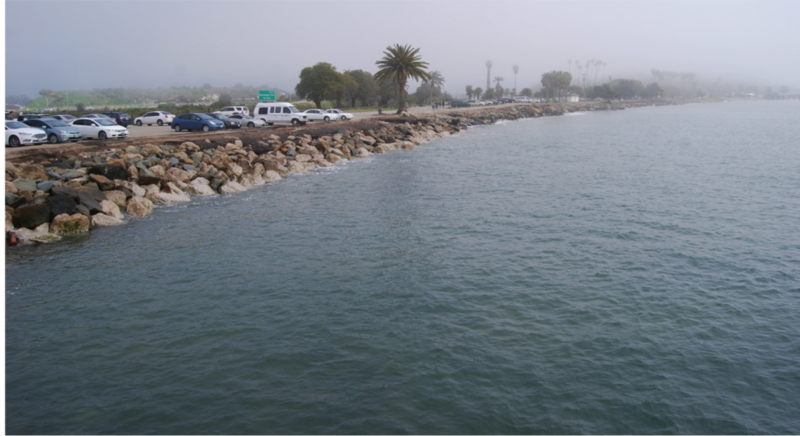 However, Ewing also noted that the Coastal Commission continues to see more permits to add armoring to our coast than to take it away – a shortsighted response that only contributes to coastal squeeze, narrowing beaches and sometimes even destroying them (see photo of what happened to well-armored Goleta Beach below). Agencies including the Coastal Commission need to start taking this issue seriously with scenario-based planning to deal with scientific uncertainty and embrace the precautionary approach. Climate change is upon us and the adaptation planning must start today! In good news, conference presenters shared success stories and lessons learned on a variety of coastal projects including beach nourishment, managed retreat, nature based solutions and wetlands restoration. Several themes emerged throughout the week. First, sand replenishment as a response to erosion should be approached with caution and viewed as a short-term solution, not relied upon as a long-term approach due to cost, effectiveness and unintended consequences. With that in mind, several successful beach replenishment projects were highlighted. Second, managed retreat and living shorelines are the preferred long-term solution, but are also potentially the most controversial and difficult to implement. Retreat involves relocation of structures and infrastructure inland in order to allow beaches and natural shorelines to migrate inland and persist as they would otherwise. 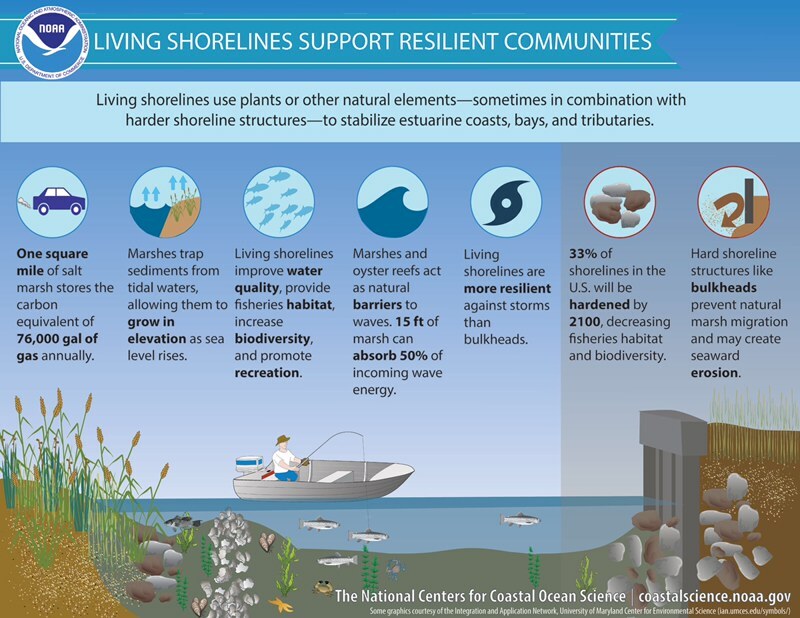 (See the diagram below for a look at how allowing for retreat and living shorelines can act as a solution.) Finally, innovation, incremental progress and a mental shift away from coastal armoring will be the keys to adapting to climate change in a way that preserves our precious coast. We also heard from California State Parks, Farallones National Marine Sanctuary, and the National Parks Service. State Parks manages 28 percent of the coastline and is currently undergoing a survey to evaluate sea level rise vulnerability at each park. Parks will be guided by the state’s Safeguarding California plan and intends to look at adaptive management and soft techniques as opposed to hard armoring solutions. The Farallones and National Park Service are both undertaking sea level rise vulnerability assessments. The National Parks Service, which manages Golden Gate National Park, Crissy Field, Stinson Beach and Ocean Beach north of San Francisco’s Great Highway, highlighted their role in the vision document, the Ocean Beach Master Plan. The plan is not a compliance document, but it lays the groundwork for a multi-agency effort to restore Ocean Beach and relocate Great Highway and other structures inland to accommodate erosion and sea level rise. This, along with sand nourishment and dune restoration, is a plan that left us hopeful for the future of Ocean Beach in San Francisco. While many great examples of restoration, relocation and living shoreline projects were presented at the conference, these projects continue to be the exception. It is not until they become the norm that we can rest assured that California’s beaches and coastal resources will be protected for all people now and into the future. If you are interested in more resources on how to get involved in beach preservation, contact your local Surfrider chapter or contact msackett@surfrider.org. There is much work to be done and we can’t do it without you!